If you're a baseball fan and amateur player, how would you like to play for the Red Sox for a few weeks? Well, that's how I feel as a lifelong diver and ocean fanatic on this expedition, except that I don't run the risk of striking out or muffing a pop fly in front of millions of people. Yesterday we were at the Phoenix Islands atoll of Nikumaroro, a thousand miles from the nearest modern city (in Fiji) and the most remote part of the Pacific Ocean. And I had another dream day. First, I had an historic dive in 10,000 feet of blue ocean with the world's greatest expert on deep sea jelly fish, Larry Madin. This was the first time anyone had sampled pelagic invertebrates in this primal ocean. 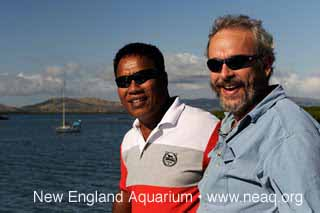 Larry, his wife Kate (also a prominent marine scientist at Woods Hole), and I put plastic screw lid sample bottles filled with water in our mesh sacks, then with Greg Stone as scientists and our safety diver for this dive, went off in the NAIA's skiff about a mile from the boat. There Larry rigged a 150 foot weighted line down from a float into the 10,000 foot sea, with four lines radiating out for each diver. We hooked onto those lines and descended with our bags 70 feet down. It became clear why we need to be tethered. In the blue ocean you lost all sense of where you were; without looking at your depth gauge you can't tell if you are going up or down, because all around you is just blue. Looking carefully, we could see shimmering against the sun all types of invertebrates, some the size of pinheads, others larger than your fist. Taking each bottle, we captured the little critters one by one in the sample bottles. Greg looked out for sharks, kept an eye on all of us and made science observations. After 45 minutes all our samples were collected and we followed our bubbles to the surface. After lunch a group including Greg, Brian, Larry, Kate, NAI'A owner Rob Barrel, and our two Kiribati members, Tukubu Teroroko, Director of the Phoenix Islands Protected Area, and Tuake Teema, Kiribati's Senior Fisheries officer, went by skiff through a passage in the surf for an historic landing on Nikumaroro. On the beach, Tukubu showed us the custom of having each person pat his cheeks with sand to show respect. We walked the virgin beach and fought through the rubble of coconuts and rotting palm leaves, searching for signs that the rats that formerly plagued the island, killing birds, had been finally eradicated. Fortunately it appeared that they were gone for good. After 2 hours in the 95 degree heat, we returned to the NAI'A. Late in the afternoon I went diving as the assistant to the world's greatest underwater photographer, Brian Skerry of National Geographic. My job was very difficult. I held Brian's wide angle camera while he used the other camera. But we were at an amazing reef, with more fish than I've ever seen in one spot in years of diving around the world. Literally thousands of fish were feeding, with large schools of different gorgeous species and individual hunters. Surgeonfish, parrotfish, snapper, wrasses, an overwhelming number, and all at a maximum depth of only 60 feet. The bright sun pierced the water, illuminating all of the rainbow colors of the tropical fish. to extinction, and thus a strong sign of the health and remoteness of this reef. As dusk came, so did the apex predators, the sharks. The beautiful blacktips were curious, but kept their distance. Not so the grey reef sharks. These sleek epitomes of sharks were aggressive and wondering if we were something new to eat, and they circled and approached to within a foot before Brian's flash or my pushing Brian's other camera at them startled them off. But they didn't give up, continuing to circle and come back at us to investigate. Brian had taken hundreds of shots, many of them quite remarkable, and after an hour and ten minutes it was time to leave this beautiful spot with it's hungry residents. My dream day ended with NAI'A's typical wonderful meal, and then we pulled anchor to leave for McKean Island, 10 hours away.